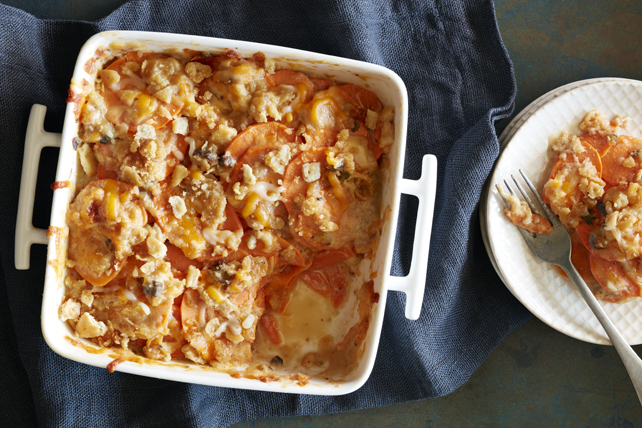 Add more appeal to your holiday table with this fun twist on traditional scalloped potatoes. Sweet potatoes are used for more flavour, and the cheesy cracker crumb topping adds the perfect finishing touch. Enjoy! Place half the potatoes in 13x9-inch baking dish sprayed with cooking spray; top with layers of onions and half the cheese. Cover with remaining potatoes. Mix soup, milk, flour, mustard, garlic, Worcestershire sauce and thyme until blended; pour over potato mixture. Cover. Bake 30 min. Meanwhile, combine cracker crumbs and margarine. Sprinkle potatoes with remaining cheese; top with crumb mixture. Bake, uncovered, 30 min. or until potato mixture is heated through and top is golden brown. Prepare using any canned cream soup you have on hand, such as cream of celery or chicken.